I was recently asked to give a sermon on these words of Yeshua, spoken shortly before his death on the cross: “My God, my God, why have you forsaken me?” In the original Greek New Testament, both Matthew and Mark, the only two Gospel writers to report this, provide not only the translation of what Yeshua said, but also a transliteration. A transliteration is when the sounds of one language are written with the letters of another. That’s what is happening every time we write, “hallelujah,” which is an attempt to write the actual Hebrew using English letters. Translated into English, hallelujah would be “Praise the Lord.” Very few times in the New Testament the writers provide transliterations as they do in the case of “My God, my God, why have you forsaken me?” Matthew’s rendering (slightly different from Mark’s) is “Eli eli lama sabachtani (the “ch” is pronounced as in “Bach”). To the Greek or English reader, it is clear that Yeshua is quoting the opening words of Psalm 22. This should not be surprising as this is only one of several examples of references to that Psalm. But what is not immediately clear to the Greek or English reader is that “Eli eli lama sabachtani” is not a direct quote of the original Hebrew text. Instead it is a mixture of Hebrew and Aramaic, which was most likely the common Jewish way of speaking in those days (scholars debate the exact nature of the Jewish language of that time, but that doesn’t affect our discussion). Not directly quoting the Hebrew may be one of the reasons why those nearby didn’t realize what Yeshua was saying (see Matthew 27:47), and one of the reasons why Matthew and Mark went out of their way to report exactly what was said. By not quoting the scriptural text, but using the common language of his day, we see how very personal these words were to Yeshua at the time. Nothing wrong with quoting Scripture, but Yeshua owned these words in a very intimate way. But what did they mean to him? Only the one who truly knows God personally can utter such a cry. Atheists can’t, since they are settled in their minds about God’s existence: “I feel alone, because I am alone.” The agnostics, as they aren’t sure whether or not God exists, live with uncertainty: “I feel alone, because I might just be alone.” They may be confused about God and life perhaps, but not desperate. Even a so-called believer may not ever experience such desperation, because they can claim to believe in God, but not be convinced that he is personally interested in them or able to help: “I feel alone; it would be nice if God could or would help me, but, oh well, I’ll get by somehow.” But when you know that God is able and normally willing to help, but for reasons you don’t understand, has left you to fend for yourself, when you have tasted intimacy with God, knowing him as your loving father and best friend, but the forces of darkness have borne down on you and there’s no letting up in sight, then to cry “Where are you God?” is the most bitter cry of all. What David went through in Psalm 22 and what you might be going through right now, is something with which Yeshua can completely identify. Yeshua experienced complete abandonment as he faced the full brunt of the effects of human rebellion against God: betrayed by a close associate, misunderstood by family, and abandoned by his close friends, even denied by one of them. In court, he was falsely accused, the victim of false testimony as he faced a corrupt and misguided justice system. He endured excruciating, unending pain as, all the while, his body was shamefully exposed. He was mocked and derided as a fraud as his faith was shoved in his face and his identity was completely undermined. And through it all, there was no one to protect him or help him with no relief in sight. But what made it way worse was that, all the while, he knew, better than anyone who has ever lived, that his help was right there – watching – able to do something, but doing nothing. When we see this in the context of Psalm 22, we see that that Yeshua is identifying with the godly of the ages. For it is those who truly follow God who tend to experience this profound sense of abandonment – that the God whom we love and serve has abandoned us, when he hasn’t really. For whether or not Yeshua was truly abandoned in the particular moments in which he uttered these words, we know that in the end, God vindicated him by raising him again to life: the same expectation for all who entrust themselves to God in Yeshua’ name. The experiences of Yeshua on the cross and of David in Psalm 22 remind us that those who truly love God will feel abandoned at times. In fact, it’s when we do God’s will that the likelihood of feeling abandoned increases. Both Psalm 22 and the crucifixion remind us that however difficult life may get, God will never truly abandons his people. 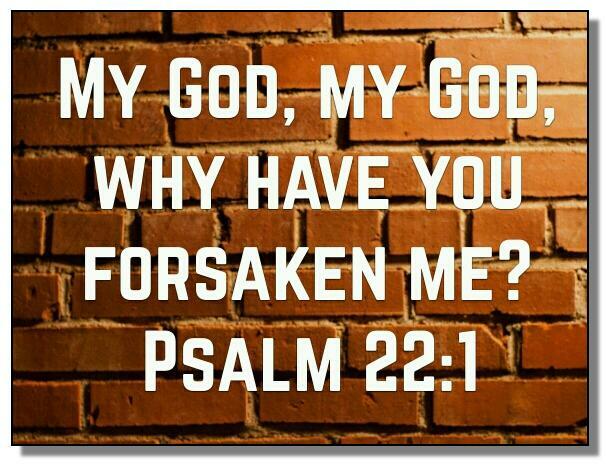 I wonder how many people who love God, but feel abandoned by him hesitate to cry out “Where are you, God?” out of a fear of being disloyal to him. You might be surprised at how God might answer you should you allow yourself to be honest with him and yourself. I also wonder how many of us are afraid to stand up for God as did David and Yeshua out of an intense fear that we might have to stand alone. Because, and this might surprise you: it is when we allow ourselves to stand alone for God that we discover that we are not alone in God. What a blessing to have your perspective on this Alan. Your understanding of God’s word in proper context communicated so clearly is a rarity. Thank you.